Blinking text on a webpage can be extremely annoying. 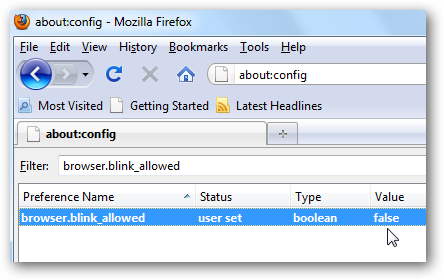 Here we take a look at how to disable the annoyance in Firefox. I ran across a page the other day that had a bunch of annoying blinking text and had forgotten this tweak to disable it in Firefox. This tip has been covered in several places over the years, but seeing how we haven’t written anything on it yet, we will walk you through turning it off as well. 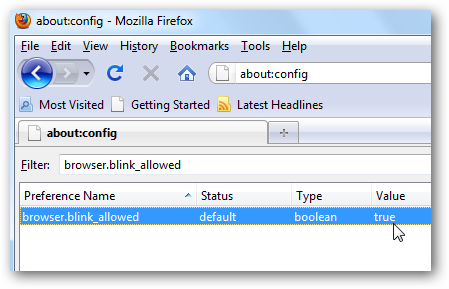 Open up Firefox and enter about:config into the address bar then hit enter. If you get the void warranty message just click on “I’ll be careful, I promise!” and uncheck the box next to “Show this warning next time” if you don’t want to see it again. Now in the Filter box type in or just copy and paste the text below. You will notice the value is set to true. Double click on it to toggle the value to false. Double click on it to toggle the value to false. Now just refresh this page and the following text should no longer be blinking. I did this on Firefox 3.5.3 but should work in older versions of Firefox as well. Blinking Text On a web page is extremely annoying!